The Geneva Psalter played and sung in the Grote Kerk Gorinchem (NL) with organist Gerben Budding and chamber choir Canticum Amicorum. 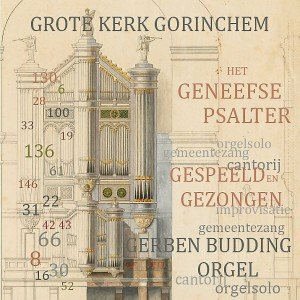 On the CD Gerben Budding plays the Bätz-Witteorgel from 1853 in the Grote Kerk Gorinchem. The vocals are provided by chamber choir Canticum Amicorum conducted by Patrick van der Linden, by the soloists Marjon van der Linden, Margreet Rietveld and Geert Rolfes, and by an ‘occasional municipality’ led by Karel Demoet. “A double CD with psalm works that are different for many, idiosyncratic above all: do not let them bother about it: everyone who cares about the Geneva Psalter should have these CDs in his / her chance. sample card of what has been done in the Netherlands in recent decades on ‘artisanal’ psalm compositions, in which concertante as well as liturgical music is discussed “(Review of Orgelvriend, April 2016). The double CD can be ordered via the order button on this page (€ 22.50 excl. shipping costs).